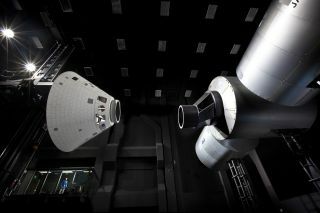 Lockheed Martin’s Space Operations Simulation Center in Colorado can simulate on-orbit docking maneuvers, using mockups of NASA's Orion space capsule (left) and the International Space Station. The first version of NASA's new manned Orion space capsule is ready to begin a series of rigorous trials, in preparation for the vehicle's first test flight in 2013. NASA's prime contractor for Orion, the aerospace firm Lockheed Martin, unveiled the prototype spacecraft and a spacious, state-of-the-art testing center yesterday (March 21) near Denver, Colo. Lockheed's Space Operations Simulation Center (SOSC) will put Orion through various paces, testing its navigation, ranging, descent and landing systems, among other features. Originally designed to launch atop NASA's Ares I rocket, Orion vehicles were expected to serve as NASA's successor to its space shuttle fleet, which is set to retire this year after three decades of spaceflight. The space agency planned to use Orion vehicles to ferry astronauts to and from the International Space Station. But the Orion spacecraft's mission has since changed. Last year, President Barack Obama cancelled NASA's moon-oriented Constellation program, which included the Ares I, and ordered a new plan that favors asteroid and Mars exploration. Under the new plan, Orion vehicles would primarily serve as escape ships for space station crews, and they could play a role in future deep space exploration. Lockheed has seized upon the latter possibility, drawing up plans to send several linked-up Orion capsules to an asteroid — a potential manned mission called "Plymouth Rock." The aerospace firm has also developed several other scenarios, which it envisions leading eventually to a manned Mars mission with Orion. In addition to Plymouth Rock, the possibilities include a mission to the Lagrangian Point over the far side of the moon and a journey to the moons of Mars that would complement robotic missions on the Martian surface, officials said. The gumdrop-shaped Orion spacecraft have a diameter of about 16.5 feet (5 meters) at their widest point. Upon their return to Earth, they will splash down in the ocean like NASA's Mercury and Apollo capsules, rather than land on a runway like the space shuttle. The Orion vehicles were originally designed to carry four astronauts to the moon or six astronauts to low-Earth orbit, though NASA scaled down the initial crew size to four people in 2009. NASA has already performed several tests of the Orion spacecraft design. In May 2010, for example, the space agency successfully tested the Orion launch abort system – a rocket-propelled escape tower designed to pull the capsule free of its rocket during a launch emergency. And last July, the spacecraft design passed its Phase 1 safety review of NASA's Human Rating Requirements – a rigorous check to determine if the capsule was safe for carrying astronauts. The Colorado tests will build on those past successes, helping validate Orion's ability to endure the harsh environments of deep space ahead of its first orbital test flight in 2013 and the start of operational flights in 2016, Lockheed officials said. At the SOSC facility, engineers will assess the Orion prototype's navigation and docking technology, as well as test aspects of the craft's ranging, rendezvous, imaging, descent and landing systems. The 41,000-square foot (3,809 square m) SOSC is built on a deep Colorado bedrock formation, and as a result is largely shielded from any local seismic disturbances. This foundation provides an ultra-stable environment for testing the precision instruments and accurate navigation systems needed for space vehicles, officials said. Lockheed held some demonstrations at the SOSC yesterday to show off what it can do. The demos featured simulated missions to an asteroid and the space station, using laser- and optically guided robotic navigation systems, officials said. After finishing a variety of tests in Colorado, Lockheed will ship the prototype Orion capsule to Virginia, where it will undergo rigorous water-landing trials.